Our annual Top Social Justice Memes considers memes used or created by our social movements to challenge the status quo, and the mass memes shaping politics and pop culture. Memes spread meaning through story via symbols and practices. More than mere internet graphics, memes are transmitted through writing, speech, gestures, images, rituals, and other phenomena. 2017 was an amazing year for stories and memes! This year we found ourselves noticing a pervasive turn from the basic NO of protest, to a values-driven YES to the world we are fighting for. Also, both everywhere and nowhere, on this year’s list is #FakeNews. Trump made it to the White House buoyed by story, and the impact of #FakeNews on that rise is still being unpacked. And he in turn has weaponized the idea, turning it against journalists who are telling truth to power. But at CSS, we say that the currency of narrative is meaning, not truth. While the fretting about the “untethering from reality” in the Trump-era news cycle reflects some important changes in our cultures’ most powerful stories, it’s also not the whole picture. The way that traditional journalistic truth is bounded by a white, hetero, cis-male, and upper-middle-class version of “objective truth” calls into real question the stability of either pole in this fight. So we find ourselves not yearning for a return to “sane objective truth” in the news, but for a collective journey forward to truths about the value of all human lives and the possibility for just futures. We’ll need all the power of our imaginations to make that journey together. Looking back, and building this list, we see more hope, power and possibility than anything else, and we can’t wait to see what our movements will do in 2018. Don’t think of it as 10th place, think of it as the beginning of a big year and a theme that will frame the rest of this list. Massive turnout across the country to a day of action framed around the #WomensMarch was making headlines. Struggles over leadership and message marked upheavals in the planning teams at the main march in Washington, D.C., and in many other cities, as women of color insisted that a response to sexism and patriarchy include an analysis of race and class. 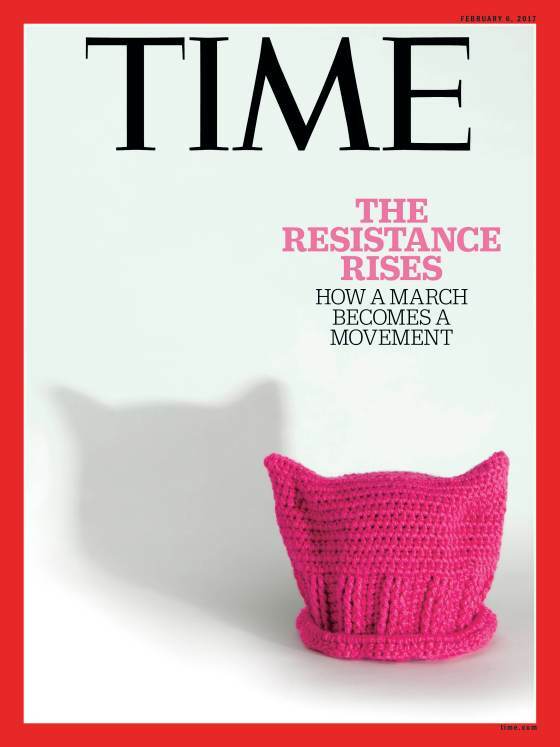 Hand-knitted #PussyHats were everywhere. But then Angela Peoples and her lollipop showed up and threw everything into sharp relief. While thousands of white women took to the streets to march against the sexism and misogyny on display during the election, it was clear from exit polls that as a class, white women had chosen the side of white supremacy over the shared liberation of women. Download Resistance Bingo in 4 languages. After inauguration day, many moments lifted up the idea of Resistance. But many times this energy came from unexpected corners, creating the sense that resistance really is everywhere. Our own project, #ResistanceBingo, inspired by Super Bowl bingo cards of years past, blew up unexpectedly and drew interest and inspiration in over 40 countries. Those bingo cards echoed a major theme of this year: the refining of “resistance”. From the simple NO to stories about what NO really looks like, and how we’re shifting to YES — organizing, community building, power building for alternatives. Before all was said and done we’d produced the cards in 4 languages, and seen it deployed by small and large groups in multiple countries. But many other moments of unexpected resistance inspired us, like #MisMedidasSon (My measurements are…), in the spectacle of the Miss Peru beauty pageant, with all its shining lights and glitz and glamour in place, but with the contestants replacing the announcement of their body measurements with sobering statistics on the patterns of gender violence in their country. From beginning to end, in 2017, resistance was everywhere. On inauguration day, #ResistanceAuntie floated to the top of the deluge of protest photos, helping to illustrate the need for a more intersectional and complex unity, beyond a white-washed version of feminism. Then in November Juli Briskman gave the President’s motorcade the finger, and lost her job at a government contractor as a result — exhibiting both widespread disgust and anger at the current administration, as well as the risk that even small acts of resistance bring. In between those two literal birds were dozens of moments throughout the year where individuals and groups, inside and outside the halls of power, gave 45 the finger. 7. #UnnaturalDisasters — Climate Change is real & already here! Some memes just make themselves. In 2017, did we move past the need for cli-fi and into a world where the impacts of climate change are at a scale and breadth that can no longer be ignored? 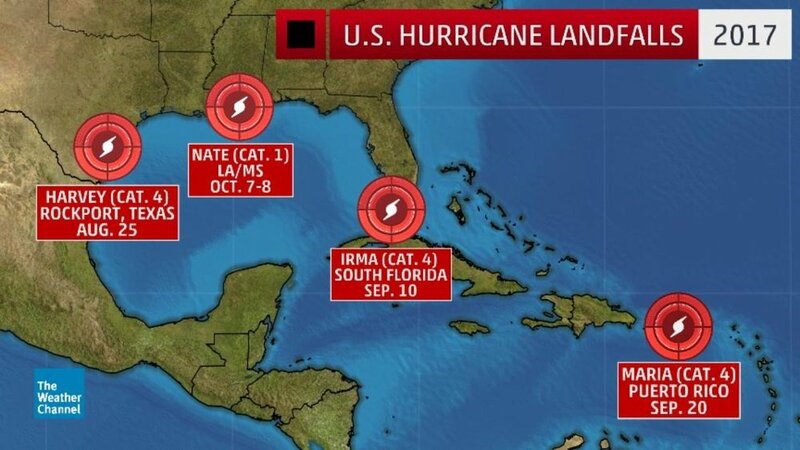 In the same year that the U.S. pulled out of the Paris climate accords we had hurricanes #Harvey and #Irma ravaging Texas and the southeast. Large swaths of the west coast burn in dramatic fashion while communities organize for a just recovery after the hurricanes in places like Texas, Florida, and Puerto Rico. But none of these events begged the need for dramatization or complicated explanation. Perhaps the ultimate show-don’t-tell, from the images of people ignoring the tragedy, to the maps of hurricane damage, to the smoke that filled our lungs, it was hard to escape the reality of #UnnaturalDisasters both on- and off-line. Sadly, we expect this meme to move up the chart in the coming years. This year, the pop culture brand hack really came into its own. First, with Margaret Atwood’s Handmaid’s Tale — written in 1984 — having reemerged into popular culture in a hit TV show that landed as the theocratic impulse surged in U.S. national politics, the mashup of reality and the uncomfortably-spot-on dystopic sci-fi was ripe for the picking. And the mashup was everywhere. 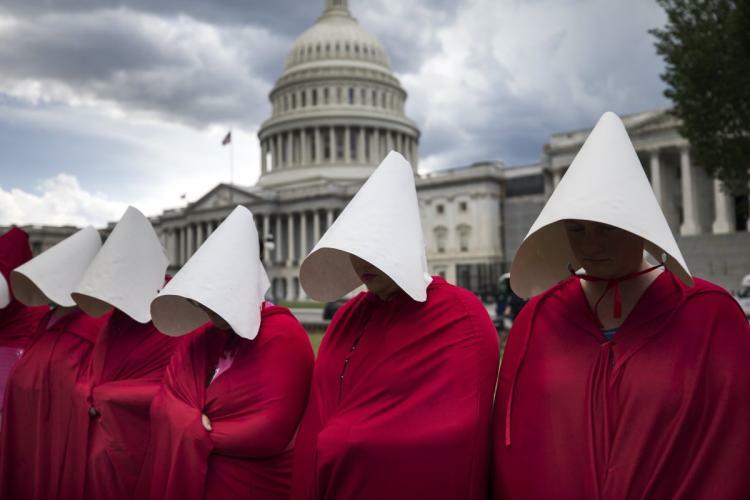 Red robes and white hats appeared in Washington, D.C. and in state legislatures and courtrooms across the country — a striking visual protest against attacks on reproductive justice. Then, upping the ante for theatrical interventions, Monopoly Man appeared on CNN, lurking in the normally-boring audience of a Senate Banking Committee hearing behind the CEO of #Equifax on live TV. And then Monopoly Man was everywhere, showing up with bags of fake money at lawmakers’ offices and answering questions on Reddit — all the while highlighting the predatory anti-consumer practices of big financial companies. When reality increasingly reflects our pop-culture fantasies and games, opportunities abound. Like #10, #NoJusticeNoPride and #15contraSB4 highlight interventions in either unexpected spaces or by unexpected people. These course-correcting actions hold accountable those who have inherited the institutionalized spaces that come out of movement struggle. #NoJusticeNoPride intervenes in the corporatized Pride culture that has substituted corporate sponsorship for collective liberation. #15contraSB4 is a purely unapologetic intervention in Democratic Party compromise on immigration solutions. Both interventions signal a steadfast insistence that any and every place needs to leverage its power to ensure justice is not left out of anywhere. #NoBanNoWall drew a connection between both the bureaucratic and concrete walls — naming the NO clearly. But #SanctuaryForAll gave shape to the YES. And throughout the year we saw creative interventions that highlighted the values at the root of resistance to walls and empire. From the early wave of airport protests, to JR’s epic installations at the current wall, to messages projected on the new wall prototypes, creative visuals helped foreshadow a future where the human right to migration wins out over empire and xenophobia. You too can get a Kaepernick pin or patch from the amazing folks at Radical Dreams. #TakeAKnee returns for another spot at #3, but this time with some friends! Kaepernick has effectively toppled his own statue, standing (or kneeling) firm against police brutality with a steadiness that has destroyed his own football career. But thousands have come forward to kneel in his place — from high school football and volleyball, to college sports, to singers and cheerleaders, to players across the NFL. All of this has driven a message of dignity and racial justice into sports-related spaces that touch millions. 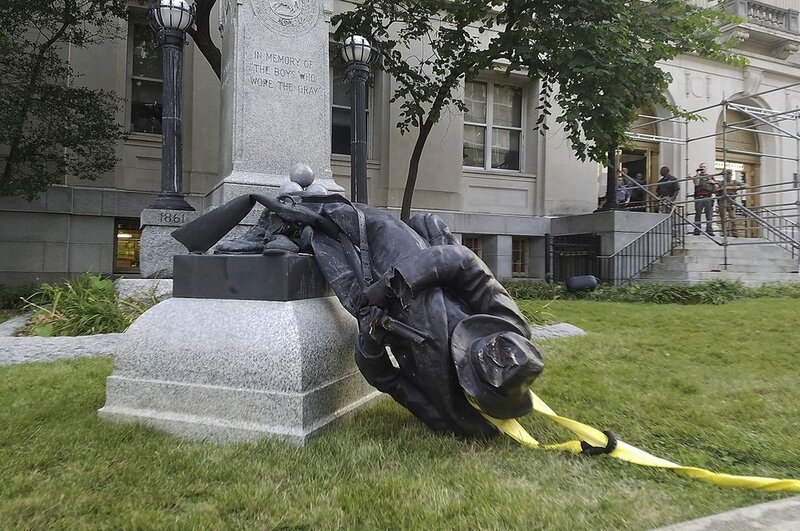 Meanwhile, since they won't be toppling themselves, the fight to pull down literal statues — Confederate and white-supremacist monuments — raged on throughout the year. The meme that Tarana Burke created 10 years ago moved from a slow burn to an explosion as daily revelations and announcements of firing and censure rocked the headlines From personal online storytelling, to lawsuits and complaints, to headlines and primetime, this battle of the story has made heroes into villains and victims into heros. Powerful men in entertainment, journalism, higher education and on both sides of the political aisle are being held to account for harassment and assault with personal and career impacts that sound to us very much like bronze monuments falling to earth. Way back at #10 we foreshadowed a lot of this list, but none more than our #1 Top Social Justice Meme of 2017: #TrustBlackWomen. We’ll start first with a reminder that dismissing protest and other actions as “merely symbolic” ignores the way in which storytelling builds in layers, expanding possibilities, and amplifying ideas over months and years until we reach collective moments where stories and reality converge. 10 years ago Tarana Burke started #MeToo. Two years ago Bree Newsome climbed the flagpole in the South Carolina state house to pull down the Confederate flag, kicking off a wave of protest and action around removing Confederate statues across the South. The wave built this year, as more literal and living statues fell. And then, in what seemed like an impossibility just a few short months previously, black women said yes to fair wages, healthcare, voting rights, and more in an Alabama special election that was about community organizing and power more than anything else. It’s not so much about who got elected, and only a bit more about who didn’t. It’s about who did the work, whose leadership we should look to, support and follow as we continue the work of creating the world we can sometimes only make possible with our stories.